WICHITA, Kan. — The holidays are over and spring break seems like it may never come, but here’s the good news: you don’t have to wait until spring to venture out for some fun. Whether you’re looking for a weekend getaway or you have a few days to explore, there is plenty to do in Wichita when it’s too cold or too dark to be outside. The city has lots of indoor attractions and activities, many providing hours of fun at an affordable cost. Let 33 museums in Wichita take you to distant cultures, days gone by and the edge of space. You’ll discover that museums in Wichita are one of the best things to do in the city. Art museums, history museums, our cluster of museums along the river – you can see one of the most complete tyrannosaurus rex in the country or a Frank Lloyd Wright house and much more. Wichita’s interactive science center, Exploration Place, has three national traveling exhibits ending in early January – Human Plus: Real Lives + Real Engineering, Genome: Unlocking Life’s Code and Eat Well, Play Well – and several new ones opening in late January and early February. Two new exhibits will be opening at Exploration Place: Voyage to Vietnam: Celebrating the Tet Festival opens Jan. 28 and Discover the Ice Age opens Feb. 4. They also have the Boeing Dome Theater and Planetarium with daily shows. Kansas’ largest art museum, the Wichita Art Museum, is always free on Saturdays, thanks to thanks to Colby Sandlian of Sandlian Realty. The museum has several temporary exhibitions running, including “386,552: Art for Wichita.” Named for the 2016 census-bureau population of Wichita and showcasing the art and artists that have helped shape the city, “386,552” is on display through Feb. 19 and includes objects from the museum’s permanent collection as well as a rotation of current local artists. For 25 cents, visitors can purchase reproductions of the local artists’ work from two art-vending machines. Check websites for current exhibits, discount admission days and hours. Use your creativity for an hour of fun, teamwork and excitement as you find clues and solve puzzles to escape one of three rooms at Wichita Room Escape – The Mission, The Barber Shop and The Autopsy. Two of the rooms allow eight players; one allows six. You can book an entire room and time slot for your group, or purchase the tickets you need and be paired with other players. You can book as early as 30 days before your game or as late as the day you want to play; walk-ins are allowed but there is no guarantee of availability. Plan to be there for about an hour and 20 minutes, including the briefing and debrief. Wichita Room Escape is offering 10 percent off any bookings on Dec. 31 and time slots are available between noon and 8:40 p.m. If you’re a family of movie aficionados, then the high-end Warren Theatres are where you want to be. Get a bite at the Warren Diner at the east location before seeing a movie in their grand auditorium, or if everyone in your group is 21 years or older buy tickets in the Warren 21 section and enjoy reclining, heated seats and individual armrests, reserved seating and an expanded bar and food menu. View a blockbuster on one of the largest IMAX screens in North America at the west location. The Warren Oldtown is the only all-digital theater in Kansas that serves food inside the theater so you can enjoy a premium movie experience without leaving your ultra-luxurious high-back rocking chair (must be 18 and over after 8 p.m.). Get the family together for a few frames at one of Wichita’s bowling centers. Northrock Lanes has 48 lanes, West Acres Bowl has 36 lanes and The Alley Indoor Entertainment has 32 lanes. The Alley also has indoor electric go karts, a laser maze and an arcade. Laser Quest offers a multi-level arena for live action laser tag, and in the same complex you can race go karts on one of the country&apos;s only indoor asphalt tracks at Xtreme Racing & Entertainment. All Star Sports and All Star Adventures have large arcades. While both have go karts, they operate outdoors alongside the miniature golf. You can also play laser tag at the west location (All Star Sports). For indoor miniature golf, the only game in town is GlowGolf, played under black lights with florescent golf balls and putters. They also have a laser maze challenge. You’ll find ages 5 to 85 on the indoor foam dart battlefield at Dart Warz, a game similar to paintball but played with Nerf blasters. Players can bring their own dart blaster or use one of theirs. You’ll usually get in about 15 games in an hour. Prices are $8 an hour per person on weekdays and $10 an hour per person on weekends. Besides hosting practices and tournaments for soccer, basketball, baseball, softball and volleyball, Wichita Sports Forum opens up its sports courts when they are not in use by teams. That includes beach volleyball every Saturday on the facility’s indoor sand volleyball courts. Call ahead to see what other courts are available for $10 open play. All Star Sports offers a 25-foot climbing wall and for Wichita’s only full service indoor rock climbing gym, head to Bliss Climbing and Fitness. Bliss has a 38-foot top-rope and lead climbing area and a 15-foot bouldering area with top-outs. They welcome first-time climbers as well as experienced climbers. Whether you’re into hockey, figure skating, speed skating or just looking to spend time with family, the Wichita Ice Center offers lessons and time on the ice at their indoor facility. They offer public ice skating sessions daily. Check their schedule on Facebook for times. They rent skates and also operate a concession stand. Cost ranges from $5 to $10, including skate rental, depending on the day of the week. The center also offers a family skate package for $30, including admission and skate rentals for a family of four. 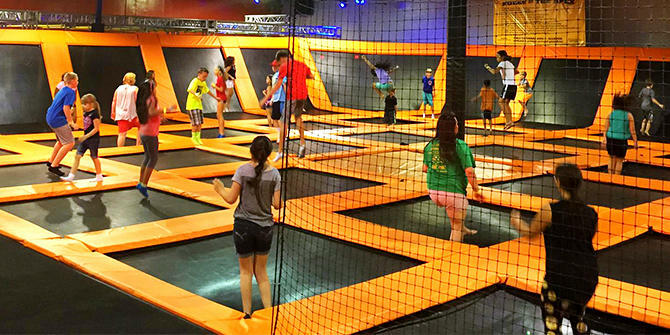 Urban Air Trampoline Park is a 30,000-square-foot indoor trampoline park and family fun center with a variety of activities on wall-to-wall trampoline arenas: foam pit, dodgeball court, slam dunk track and runway. They are open daily. If you plan to jump more than one hour, go to urbanairtrampolinepark.com for coupons for $15.99 all-day passes or a group fun pack. Aviate Extreme Air Sports, inside Wichita Sports Forum, offers 20,000 square feet of foam pits, obstacle courses, flying trapeze and other aerial fun. They are open daily and offer specials most days of the week, from Monday’s Family Night package ($35 for four) to Club Aviate nights featuring black lights, glow lights, laser lights and music on Friday and Saturday.